Sakib overcame a fitness concern to lead Bangladesh to a 64-run win and claim his 200th Test wicket in the process being the first Bangladeshi. 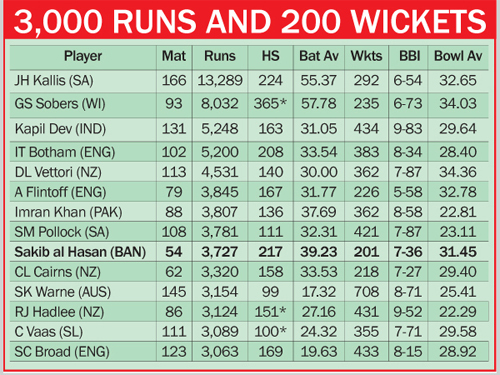 Sakib, who has now 3,727 runs, is only the 14th cricketer in history to take 200 wickets and score over 3,000 runs in Tests. With the feat, he has joined a select group of all-rounders, which include some of the great names in cricket history like Jacques Kallis, Garry Sobers, Kapil Dev, Ian Botham and Imran Khan. Sakib achieved the feat quicker than any other all-rounder, fetching his milestone in 54 Tests, one match ahead of England’s Botham. It was the icing on the cake after Bangladesh defeated West Indies on home soil for the first time in history. ‘I would not have felt good to reach 200 wickets if we had not won the game. Now that we have done this, so I am feeling great,’ Sakib said after the match. Sakib played an active role in the win picking up 3-43 and 2-30 in two innings respectively apart from making a vital contribution with the bat when he hit 34 runs in the first innings. Sakib was dramatically included in the squad for the opening Test having barely returned to training after an injury lay-off that forced him to miss the recent home series against Zimbabwe. He was expected to remain sidelined for at least three months following an emergency surgery on his injured finger in September but the physicians of the Bangladesh Cricket Board declared him fit rather surprisingly. His participation in the opening Test was uncertain until he decided very late to play. ‘I batted (in training) for only three sessions before playing the first Test. That was hardly enough, considering that I resumed playing after two months,’ Sakib said after the match. ‘That was difficult for me. But I have finished the match successfully. I am sure that I will play the next match in a better condition,’ he said. The second Test will be held in Dhaka’s Sher-e-Bangla National Stadium from November 30 to December 4.